Friday's walk started out pretty slow. Just a brief wing flap from the eagle nest, so we knew an adult was in the nest and almost certainly on eggs, but not visible from the bridge. Initially, we didn't see the other adult or much of interest from the bridge, so we started walking north birding along the road. Shortly, someone hollered to look up. There were three eagles, one near adult and two immature eagles flying high above the road, but heading towards the nest. Soon, we noticed one adult eagle perched just above the nest (probably the one previously in the nest) and one perched on a tall snag just to the south of the nest. The three new arrivals were circling above us. 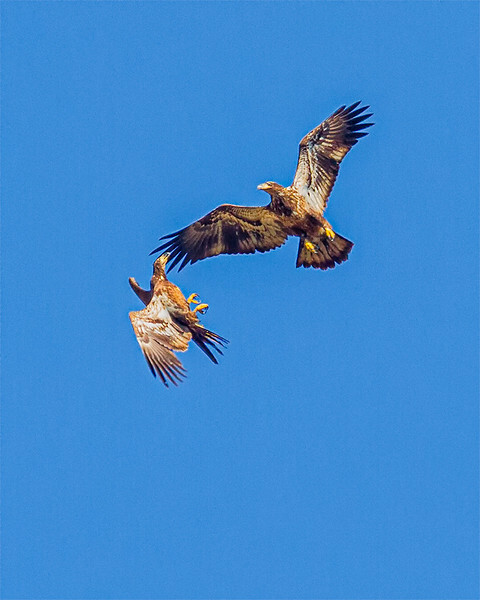 I managed to capture the two immatures engaging in some aerial acrobatics. See video. So, there were at least five eagles to watch for a few min. My thought (guess) as to what was going on is that the three high fliers alarmed the eagle on the nest and he/she left the nest to perch on the limb immediately above the nest in order to protect the eggs. The other adult had probably been guarding the nest from a nearby location, but from where we had not notice at first. I did not notice any of the "new" eagles attempt to enter the nest, but for a few min, things were happening pretty fast. There were just too many eagles to keep up with. Never thought I'd say there were too many eagles to watch. In Alaska maybe, but not on BARC.